I will be running two sets of 105/2. The first set in their original cabinets with redone crossovers. The second set with custom made cabinets. I am very tempted to experiment with tri-amping and active crossover. Basically, from the Technic Flat SU-9070 pre-amp to the active crossover (most likely a Behringer CX3400) then to two Quad 405 (mid and high) and a 606 (bass). My fear is that even if I send a signal for high frequencies only to the power amp feeding the tweeters, some parasite low frequencies might still sneak in and kill the tweeters. Is may fear founded? I don't see why it should but you could always protect the tweeter with a series cap rolling off an order of magnitude or more below the design crossover frequency which should not interfere with the target crossover response. I would use say 30 or 40uF. 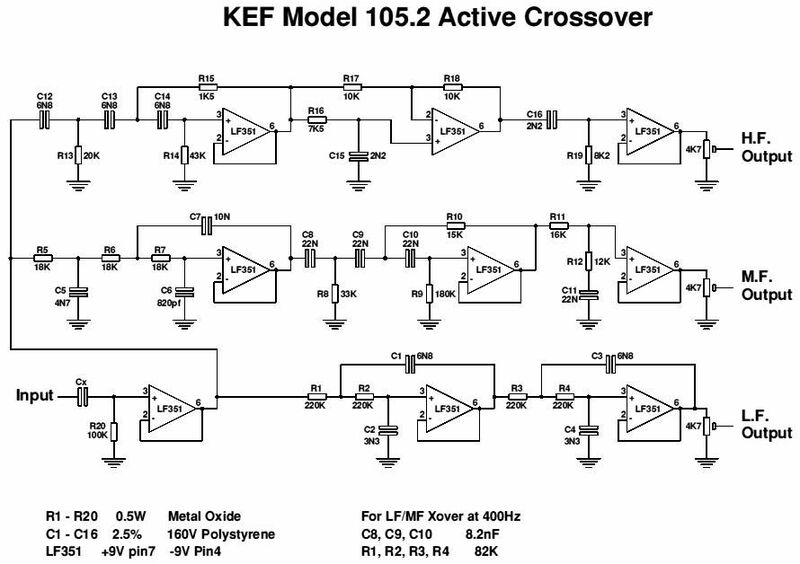 So, if you go down the active crossover path will you be taking the same steps as KEF did with the passive system or just ignoring the essentials and purely going for the theoretical crossover points and hoping for the best? I will use the same crossover points as Kef's active crossover, then adjust for volume and phase/time delay. I won't necessarely crossover the woofer at 125hz though (like the active filter suggests), but perhaps at 400Hz (just like the original passive filter). Will it be exactly like what Kef intended from the factory. Most likely not. But as I don't have the same pre and power amps, nor the same sources or even the same listening room, what's good in a location can be doomed in another anyway. So, why not have fun until I find the sound I like? Indeed. A capacitor located well below the crossover point as a simple protection is a great idea. That makes more sense now! On my old TL / Labyrynth / Pipe, I had a relay connected across the Decca London Horn. It was always in the closed position for about 30 seconds then the relay contacts opened by which time everything had settled down... it was costing me a fortune replacing the ribbons! I've actually built this active crossover, both boards are done, but I haven't finished the power supply or tested anything yet (the power supply uses dual regulators in a "pre-regulator" arrangement, much better then regulators in series and hopefully better than the kube supply since things have moved on since the 80s), I've used OPA134s for bandwidth and super low noise in the circuit heavily decoupled. We discussed changing the values to a 400Hz crossover like the passive, but after a lot of thought I believe the active 150Hz will actually be superior. It makes the head more like a "super" LS3/5a but without having to output any cone vibrating bass and the low mid room interaction should be better through the midrange higher off the floor. The only reason 150Hz was not used in the passive was the problems inherant in the inductance of the B300 coil messing up voltage output and impedance, higher up in freq this effect reduces. At ~150Hz I don't think overall the power handling capacity will be much different since the B300 is still handling all the excursion program. For the Canadians on this forum, I recommend www.axemusic.com for your Behringer needs. The CX-3400 has a useful ident at 160Hz, so I don't bother with specifics when running an active bass horn/folded damped pipe with an existing B110A/B + KEF/Celestion/Isophon/Peerless/Audax/SEAS/Decca/Motorola tweeter design . 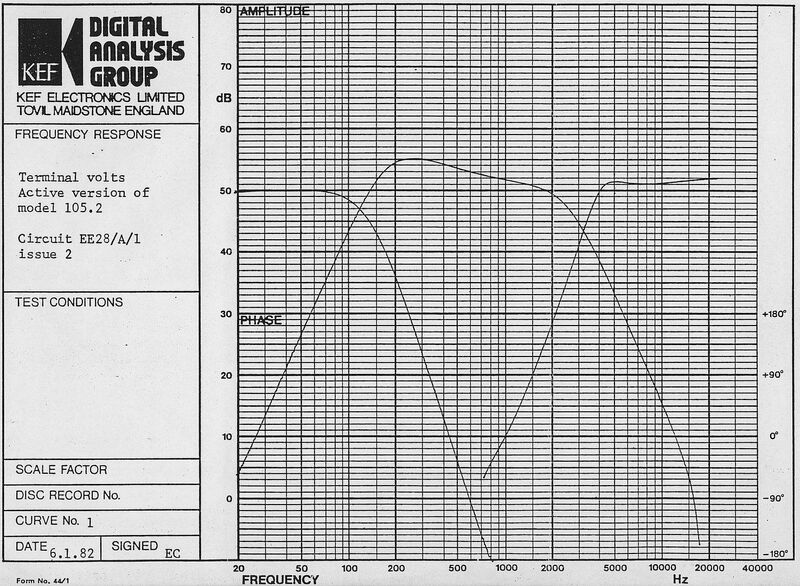 BTW Looking at the frequency graph above, I can see there's a bump centered around 250Hz on the B110. Is it natural, or was it pushed up with the active filter? There's a minima in the B110B's impedance at 280Hz, so a bit more juice in an active system will be required in that region. the shape of the active has been carefully designed to provide a flat acoustic response for those drivers in that particular cabinet configuration, the same as the target design for the passive crossover. Anything else will certainly sound different but that is down to personal preference. Myself I'm inclined to go along with all the research that Kef originally did. I'm on the same path with Lee. Since two heads from 107/2 landed on my lap but the bass units were shot, I decided to build something different. I have finished one cabinet of 180lt housing two compound B300 that I will be trying in sealed and vented mode tuned to 19~20Hz. Will be using a Behringer DCX2496 active crossover bi-amping the bass cabinets and the heads. I also have a pair of CS1 equivalents that I can bi-amp so that goes to a tri-amping scenario. Right now I am focused on gated frequency response measurements of my existing and newly restored 105.1, so that I can try things out and have means of measuring when things are going for the better or the worse. I'm a bit confused by all this. It depends on if you're working on a Mk1 or Mk2 R105. The Mk1 had an xover at 400Hz and the Mk2 had an xover at 150Hz, with the same B110 drive unit. If you're working on the Mk2 then 150Hz is the only choice really. However, if you're on the Mk1 I think you need to consider that the B110 box is not of the same capacity as in the Mk2. The Mk2 B110 enaclosure is the entire head assembly whereas in the Mk1 it doesn not include the tweeter box. I suspect that if you use 150Hz on a Mk1 the bottom end of the mid range will be suckked out due to the box dimensions restricting cone movement. Just my opinion as the person who did the active crossover drawing above. I would be very interested in any comments regarding the results peoplr are getting using it.